1，Please confirm the connected wifi signal is "wifi-*******", Only the WiFi signal connected to it can enter the 192.168.188.1 page. 2, if the setting is successful, it is in the working state. "192.168.188.1" will can't respond.If you need to modify or changing mode, you need to restore the default settings（press the reset button：8 seconds) and setup them again. [Running Speed]: Reliable 2.4GHz wireless network speed up to 300Mbps, Distance: 165ft (According to the Actual Environment Change).farewell to low speed internet, provides you max speed with 300m/s, no more delay for playing game, online transfer files and video chat. 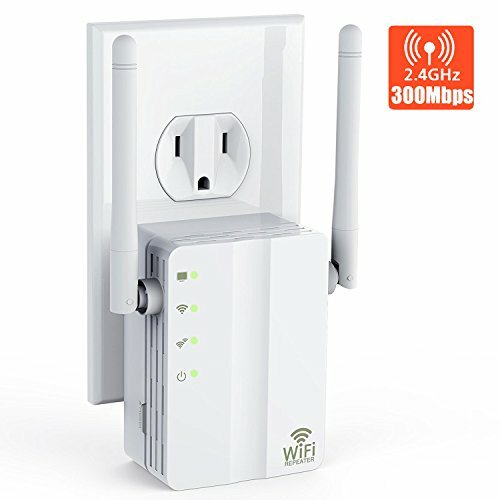 [Coverage Area]: 300Mbps wireless wifi repeater, dual realtek chipset built-in, wall-througn wifi extender, 360 degree wifi coverage. Its main function is boost the range of your existing WiFi and create a stronger signal in hard-to-reach areas. Reduce 3G/4G mobile data charges by connecting to wifi at home. [Satisfaction Service Concept] Yakalla2.4Ghz, WiFi Extender 1. Contact us via Amazon Mail if it has a quality problem. We will bear all losses, including return postage (you only need to provide postage Invoice or receipt). 100% assumes all losses!（You will do not lose a penny!）2, Our team of professionals is constantly working to make you happier. We are confident in the quality of our product and give you LIFETIME WARRANTY and great customer support. Click "BUY IT NOW" and ENJOY WIFI EXTENDER. If you have any questions about this product by Yakalla, contact us by completing and submitting the form below. If you are looking for a specif part number, please include it with your message.